I made a Danish braid here once before. That recipe used what I think is a more traditional method for making Danish dough…there was a separate butter block and lots of chilling between folds (like when we made our croissants). This one uses a “quick” method, employing the food processor to break down the butter into chunks in the flour. The rough dough does need to rest in the fridge overnight, but after that, all of the lamination work is done at once, without any waiting in between the turns and folds. Pretty easy. I was surprised at how good the results were– crisp and flaky. If you are wondering how the dough becomes a braid, this video explains all very clearly. I don’t like to ask too much of myself on a weekend morning, so I cheated a little on the fillings. Rather than fiddle with homemade pastry cream and fruit spreads, I just whizzed up a quickie sweetened cream cheese filling and combined it with some store-bought apricot jam. I was pretty jazzed to have a use for the pearl sugar I found at an IKEA ages ago. 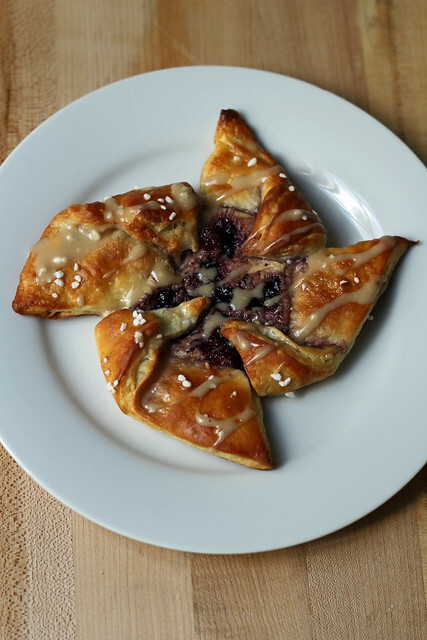 When we do a recipe that has several variations, I’m never quite sure if we’ll revisit it later to try out those variations, so I took this opportunity to make my favorite Danish shape with some extra dough–the pinwheel! This one had the same cream cheese filling as the braid, but with blueberry jam instead of apricot. We’re going without hosts now for TWD, so for the recipe, see Baking with Julia by Dorie Greenspan. It’s also here, and there’s even a video of Beatrice and Julia making Danish together. Don’t forget to check out the rest of the TWD Blogroll! Pearl sugar at Ikea? I need to look into that! I love your pinwheel. Beautiful! Soooo craving one of these right now! It’s beautiful! Your pinwheel is marvelous! And I love your “shortcut” filling, too! Awesome looking braid and I love the pinwheel! Your braid and pinwheel are both beautiful!!! I also did a quickie filling. Seemed to make this an even quicker recipe (and is a good idea). I had no idea you could buy pearl sugar at ikea. And I bet they have some good jams and preserves that could be used for the fruit filling. I’ve never seen the pearl sugar at my local ikea, but I happened to be in one in another state, and snapped up the sugar when I saw it there. maybe it’s specific to certain markets? I love the braid and I also love the pinwheel! Good for you for starting to work out with a personal trainer. The braid (and pinwheel) look amazing! The pinwheel is so cute! I was going to make individual danish with my second batch of dough, but got too lazy. Next time…because I WILL be making these again! Gorgeous braid and pinwheel. I loved the quickie method of making pastry dough. I was so happy to use my pearl sugar too (I got mine from King Arthur). 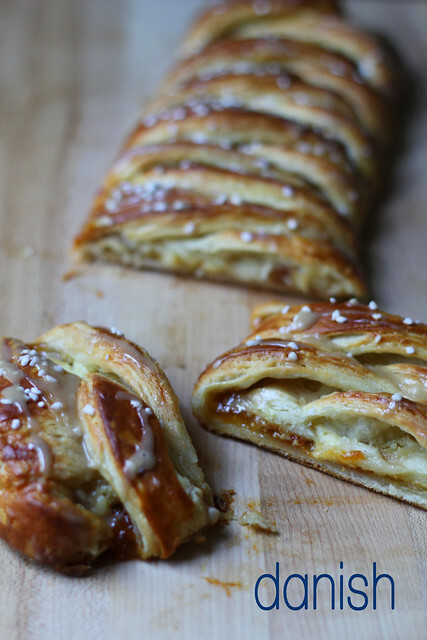 What a very pretty Danish Braid, just perfect with the light brown coffee glaze and the lovely pearl sugar as a final topping (I am grateful that I can find pearl sugar at my baking supply store). And, of course, I love that pinwheel, always have, always will – that shape is popular around here for Danishes and it is always so very cute and impressive – your version looks just perfect! Your opening cracked me up 🙂 I miss working out with a trainer – I hope you’re liking it. Your braid and pinwheel both look excellent. Now I want to try the pinwheel shape.